One week before Otto's sixth birthday, his sister Anna spoiled everything by being born. What big brother hasn't wished, at least once, that his baby sister or brother had never come along? Not only does Otto's baby sister steal the show at his sixth birthday part, but his mom gives her Otto's own baby rattle, the one that goes Jong Jingly Jingly Jong, like underwater bells. Sitting in front of his festive chocolate cake, blowing out the long-awaited six lighted candles, Otto is not a happy camper. "Come on," said Otto's dad. "Make a wish!" "I'll make a wish, all right," Otto thought, as he shook the rattle with all his might. "I wish Anna was never born!" Wham! Strange things happen. The candles flare back up and the opened presents are re-wrapped and passed back to their donors. In the following days Otto finds himself sliding up the slide at Kindergarten, taking the trash back into the house, and watching his parents take Anna back to the hospital. But that's only the beginning of Otto's growing down days. His baths make him dirty and "going to the bathroom was disgusting!" Otto realizes that his wish has somehow reversed time, and he is now under some spell which is making him live his life backwards. True, his best best friend moves back to the neighborhood while he is still five, but to his horror, Otto realizes that he is growing younger with every birthday. At his third birthday party, Otto hopes it's all a dream and when he makes his wish--"Me Wake UP!" --nothing happens. By his second birthday party Otto realizes that he is losing his words. His babyish tongue can only manage a puny wish... "OTTO BIG!" One horrible day Otto's mother put him in a diaper. Otto realized that if he didn't think of something soon, he would disappear like his sister. There was one last chance: his first birthday! 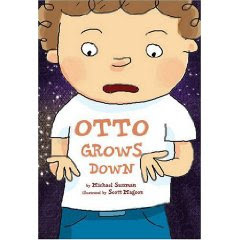 In Michael Sussman's new Otto Grows Down, fate does step in to reverse the wrong done to Anna, and Otto finally is able to say to his baby sister, in all honesty, "I'd rather grow up with Anna," said Otto, "than grow down without her!" Sussman's droll, deadpan-style text skillfully combines two well-worn story conceits--the old "be careful what you wish for" folklore motif and the oft-told sibling jealousy story, together with a creative new take on the backwards time-twister plot. (This picture book and the movie Benjamin Button were apparently in production simultaneously, so there's no obvious borrowing here.) Scott Magoon's comic depiction of a six-year-old who realizes that he didn't know when he had it good will have kids giggling and adults chuckling perhaps with rueful self recognition. A fresh and imaginative take on some venerable material that is sure to please, while giving all readers a bit to contemplate. Interesting story, this is something that happens commonly around the world, it's the most perfect interpretation of reality.